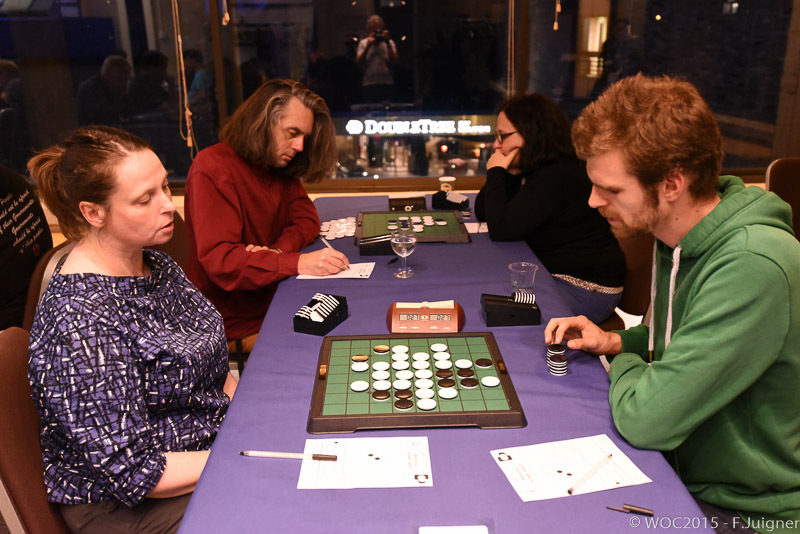 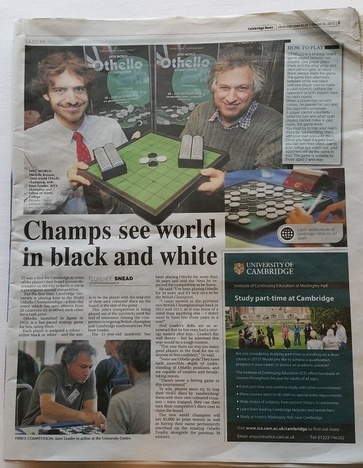 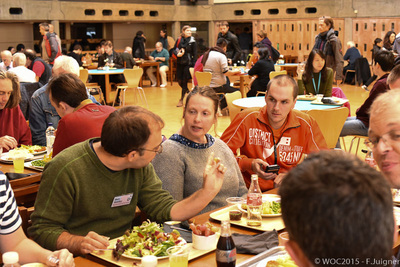 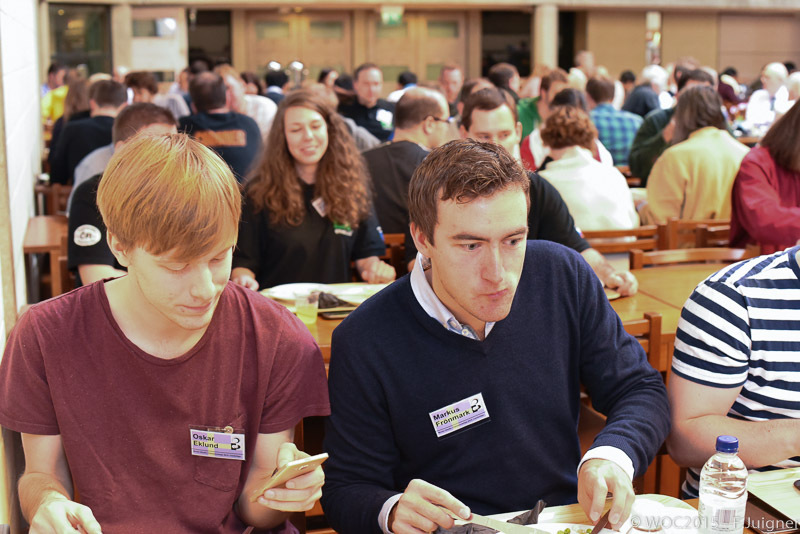 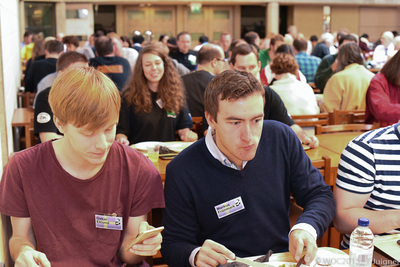 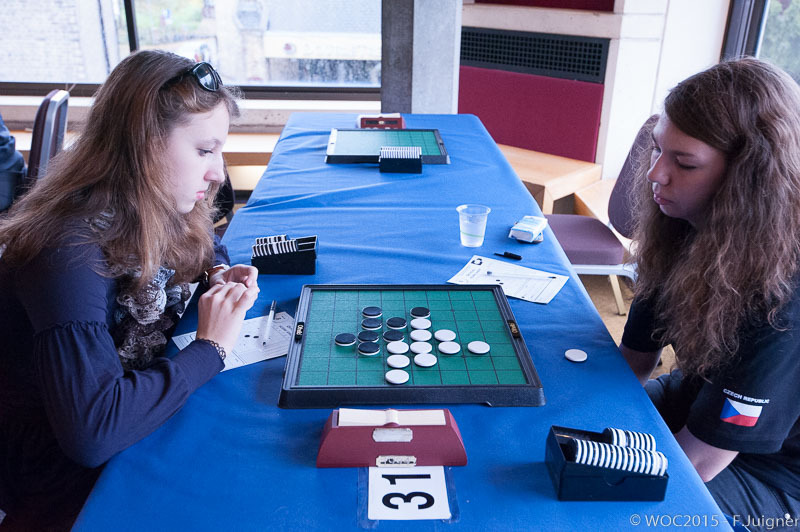 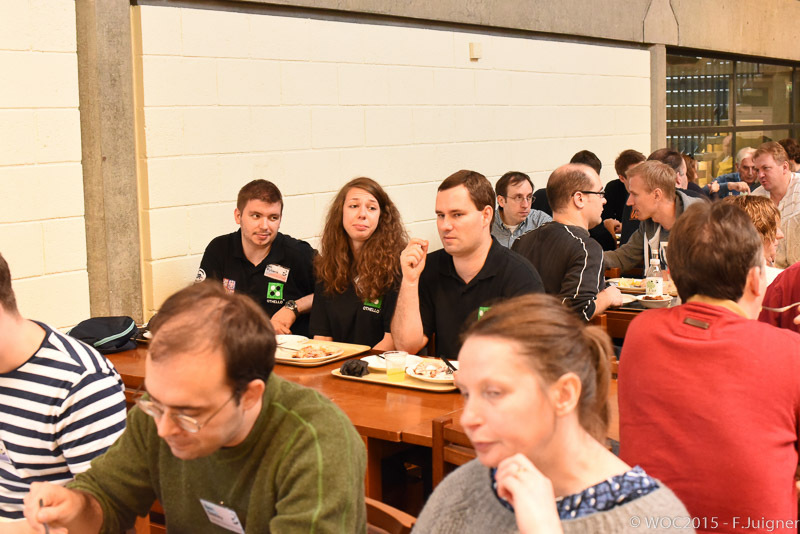 A nice report about the World Othello Championship in the "Cambridge News". 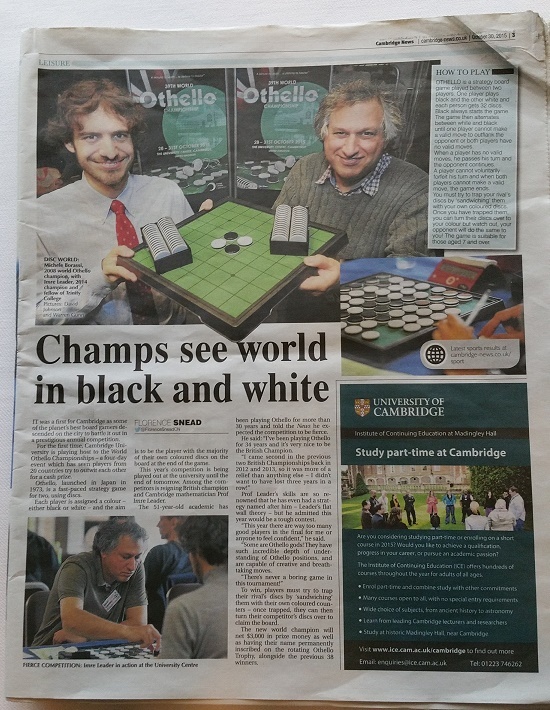 It does not happen often, that you open the paper at breakfast and get to read about Othello heroes. 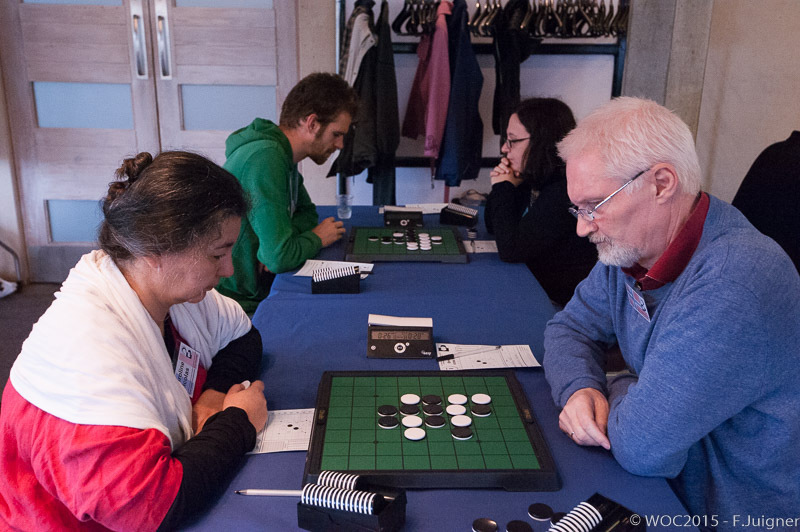 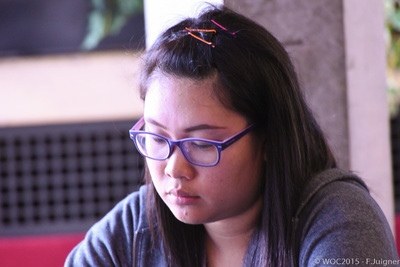 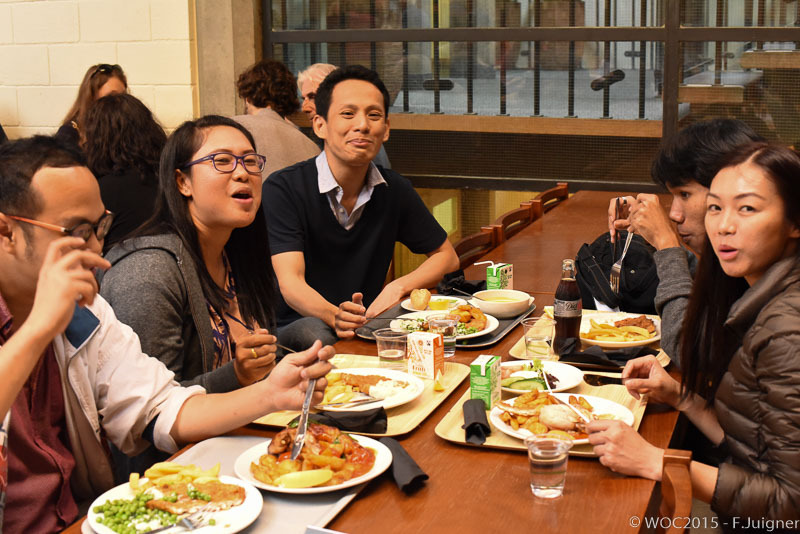 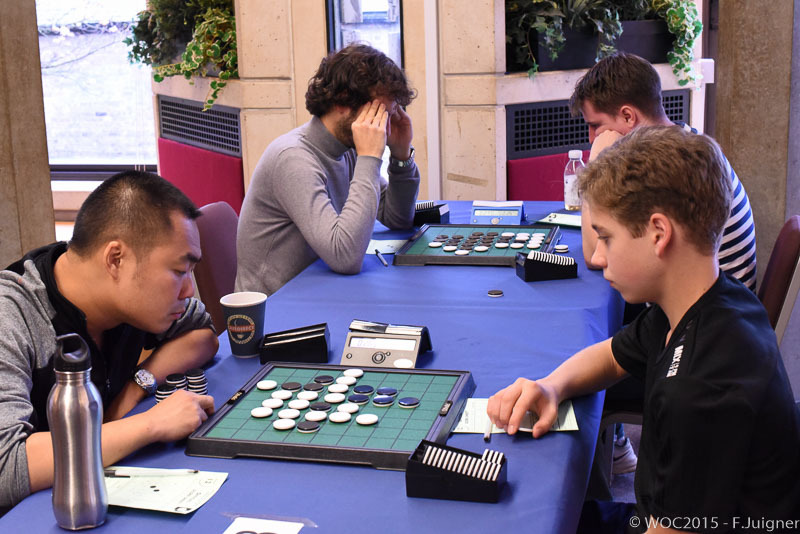 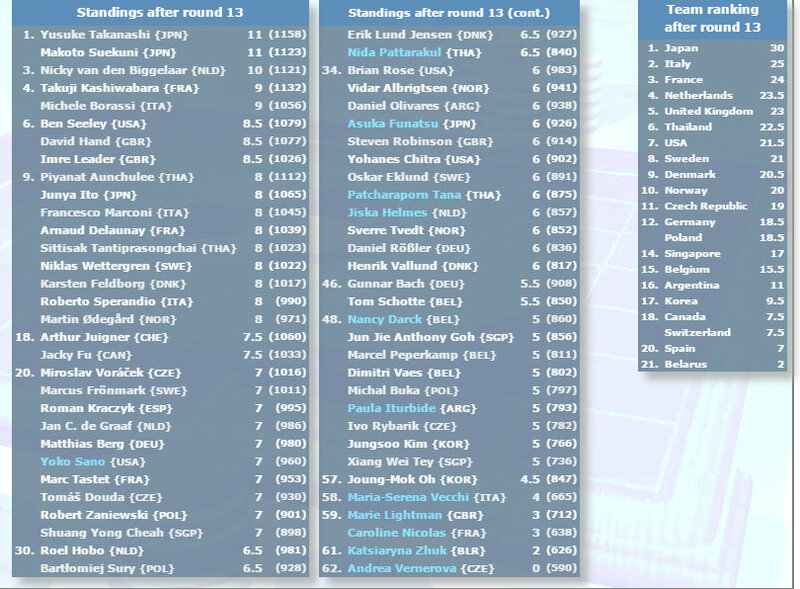 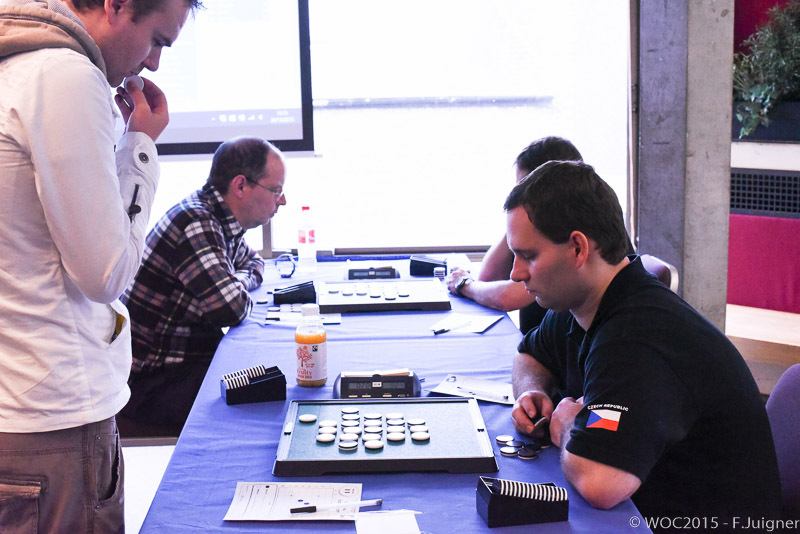 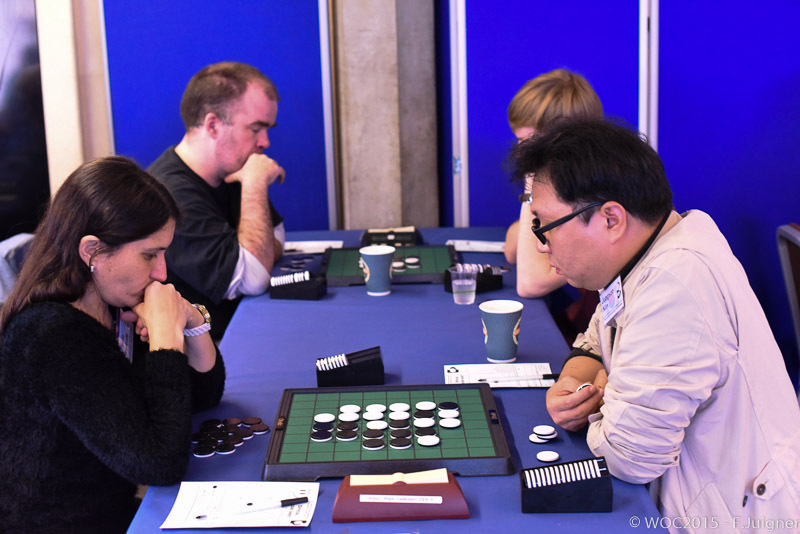 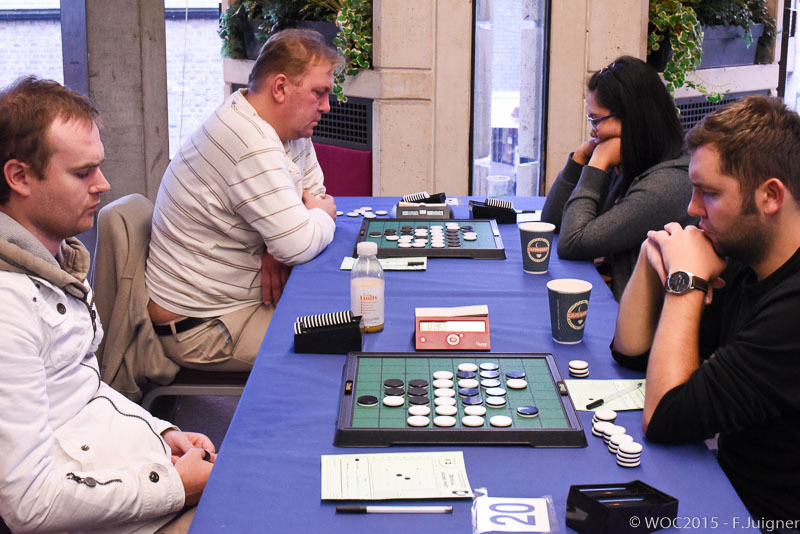 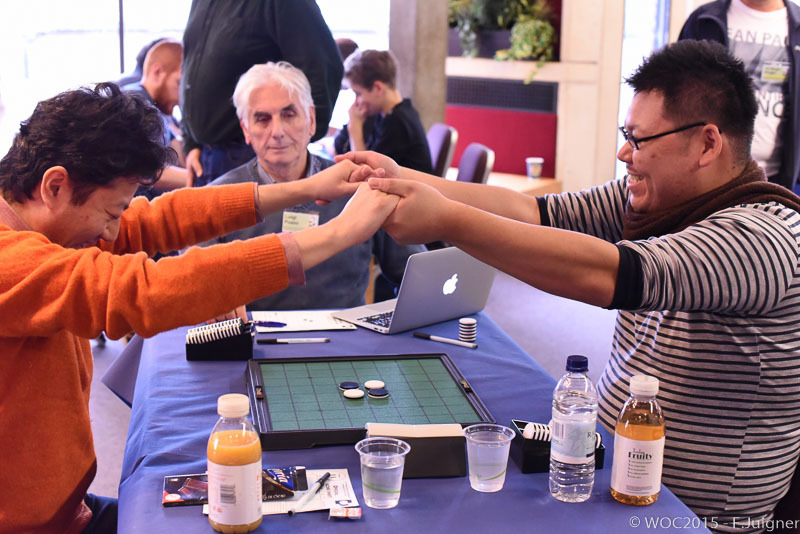 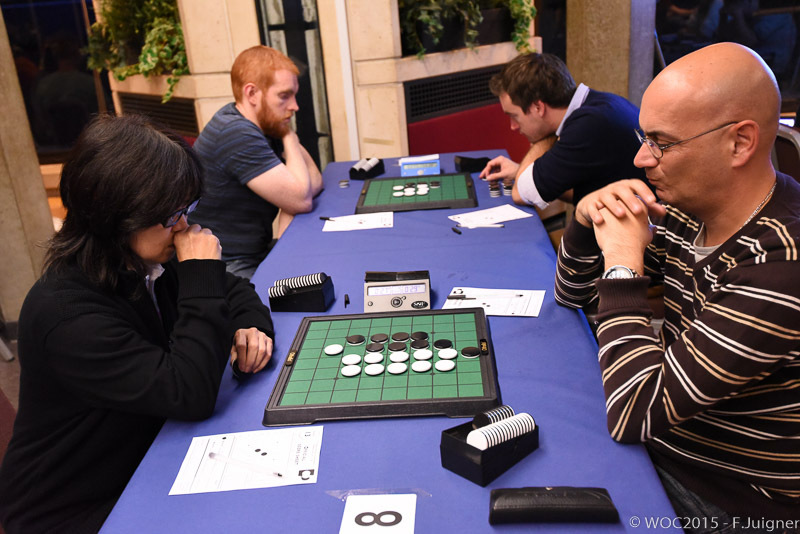 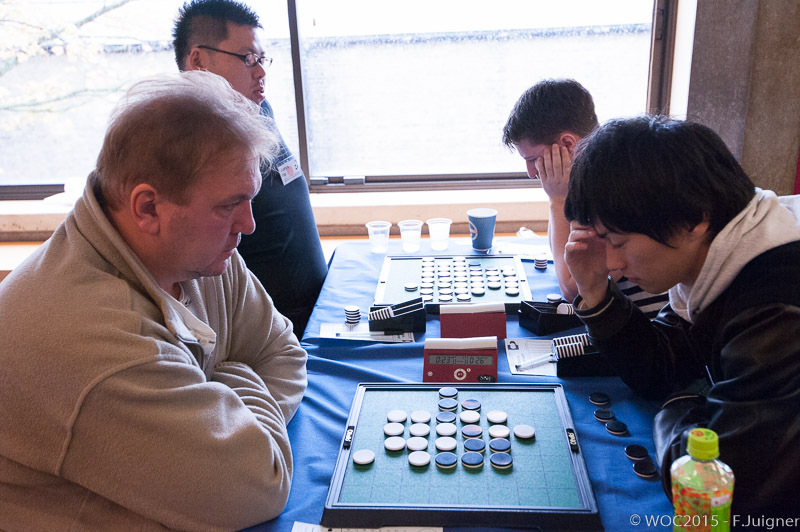 We had 3 players with 6 points after round 7: Makoto Suekuni, Nicky van den Biggelaar and Takuji Kashiwabara. 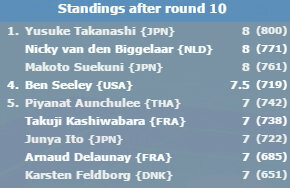 Takuji killed David Hand 55-09 and Nicky lost 25-39 to Makoto. 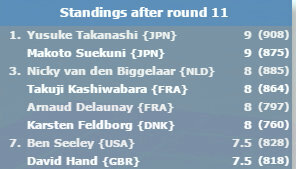 So now we have two players at the top. Arthur Juigner lost to Arnaud Delaunay 37-27. 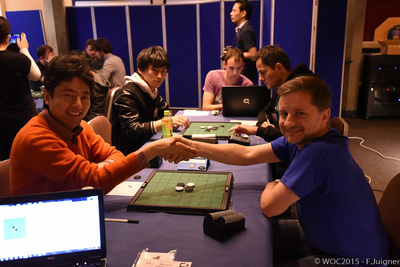 Yusuke Takanashi won his game against Roman Kraczyk. The other Japanese team member, Junya Ito, lost 27-37 against Niklas Wettergren. 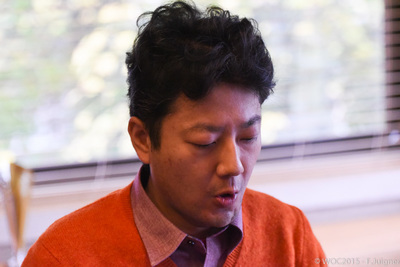 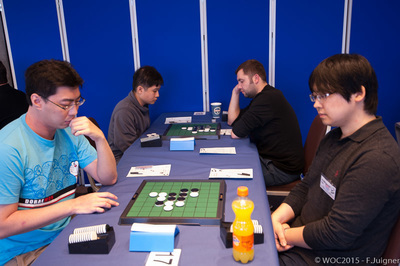 Makoto Suekuni defeated Takuji Kashiwabara at table 1. At the end of the game lots of players were gathered around the table to see what was happening. 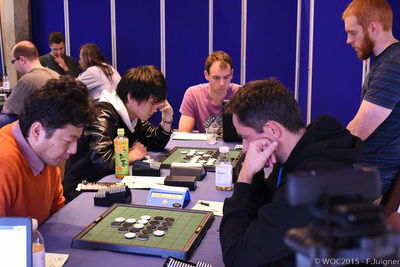 Yusuke Takanashi won against Jacky Fu. 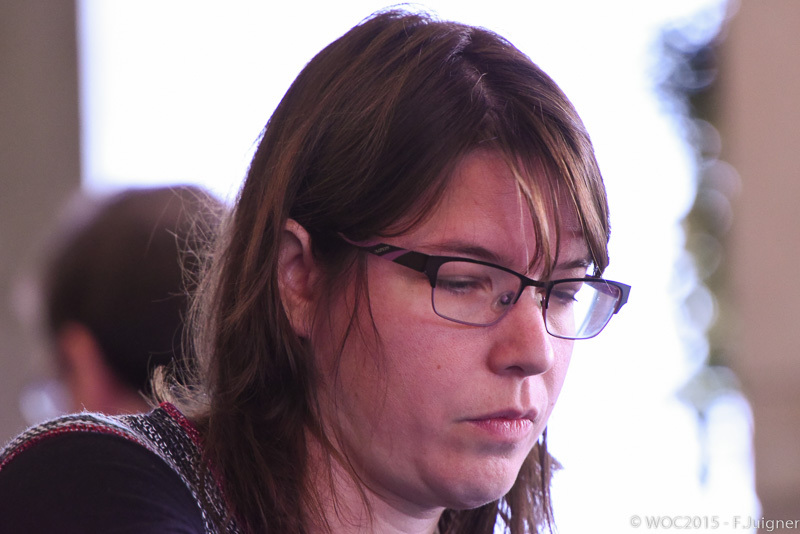 Nicky van den Biggelaar won against Niklas Wettergren, they both had 6 points after 8 rounds. 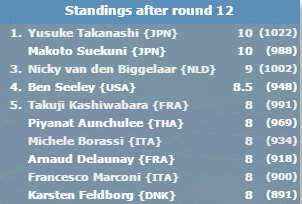 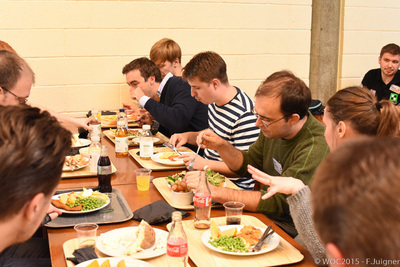 This is the Iast round before lunch. 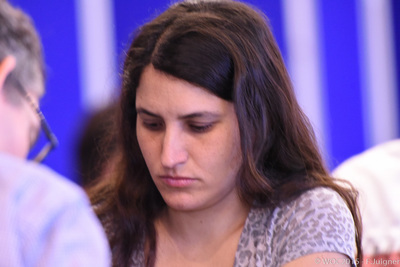 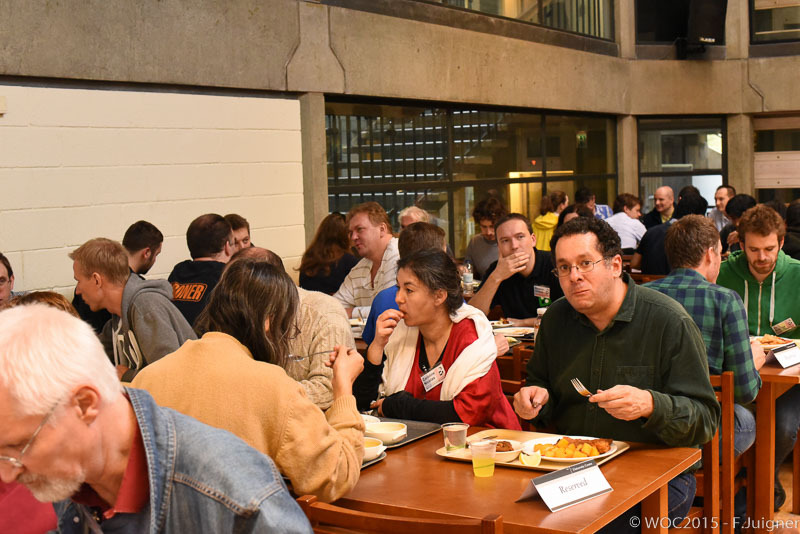 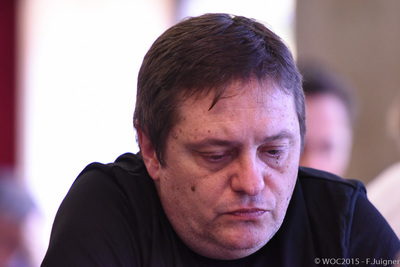 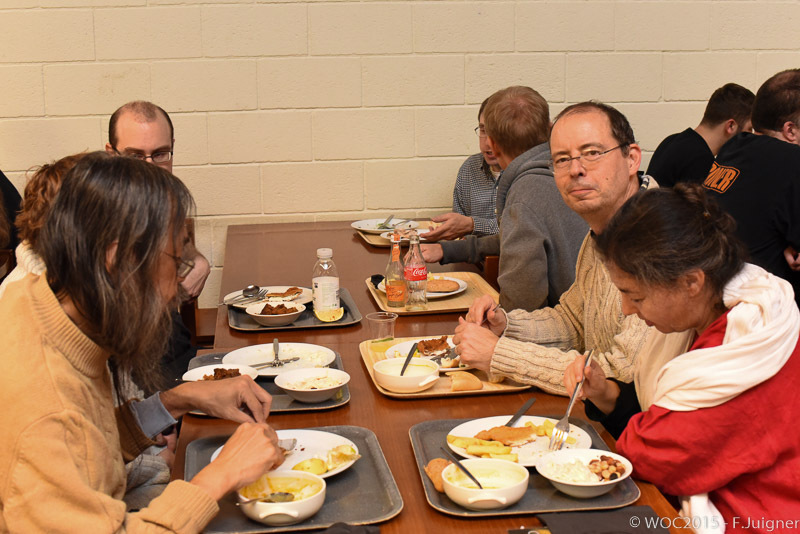 I did not have breakfast today and so I did not even dare to enter the tourney room, I was afraid the noise of my empty stomach would disturb the players. 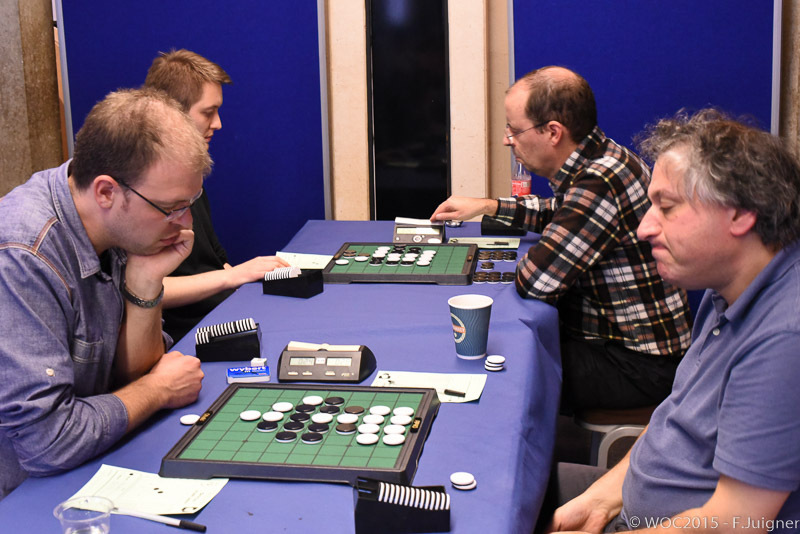 So I stayed at the tournament office that I share with the French, Emmanuel Lazard, Stéphane Nicolet and François Juigner. 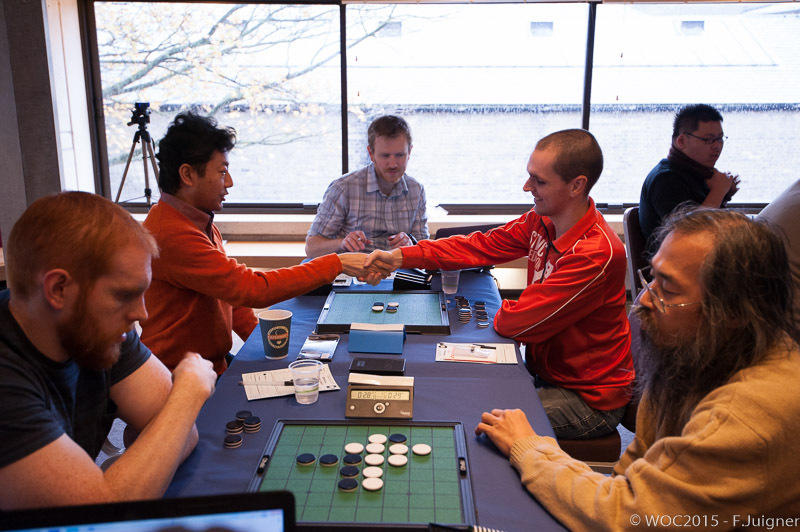 We followed the game between Takuji and Nicky (France versus Netherlands) on LiveOthello and the age old rivalry between our two countries surfaced. 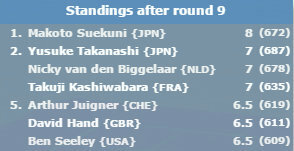 Well done Nicky!! 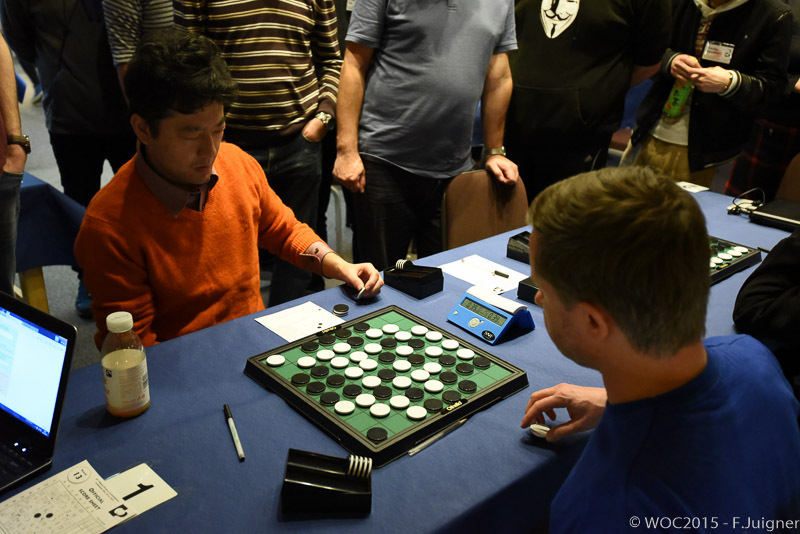 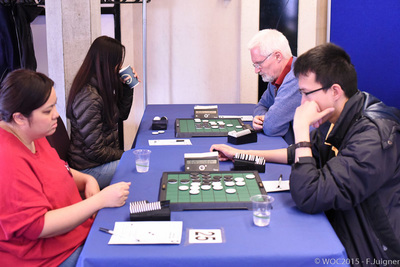 A lot of players watched the game between Yusuke Takanashi and Makoto Suekuni, some even referred to it as "The game of the Othello Gods". ​Question by Stéphane Nicolet. 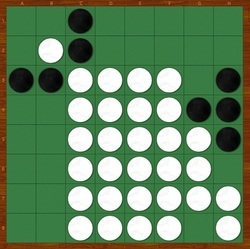 What moves you have to make to get to this position? 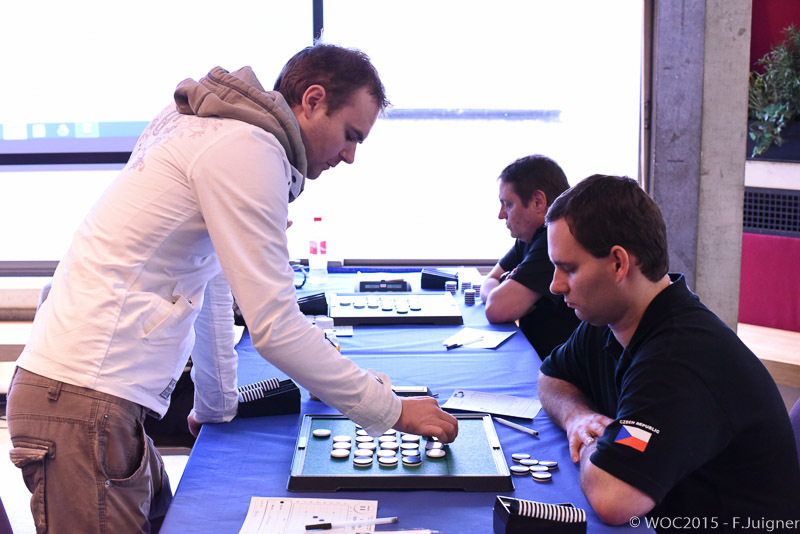 The answer lies hidden in the brains of Delaunay and Leader. 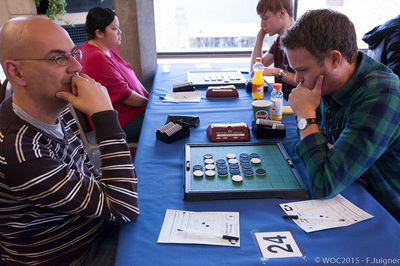 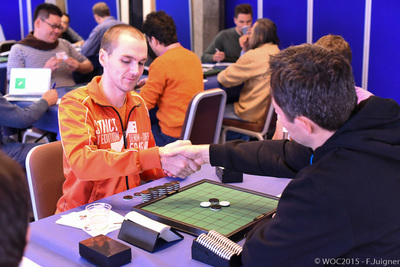 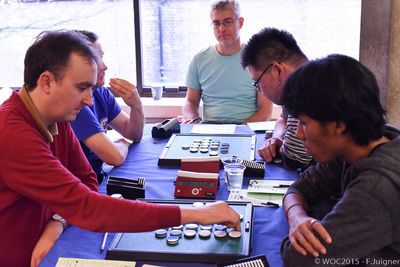 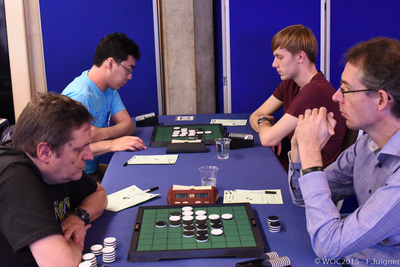 ​A very interesting 31-33 game between David Hand and Yusuke Takanashi. David seemed to be winning but in the endgame he gave away the win. 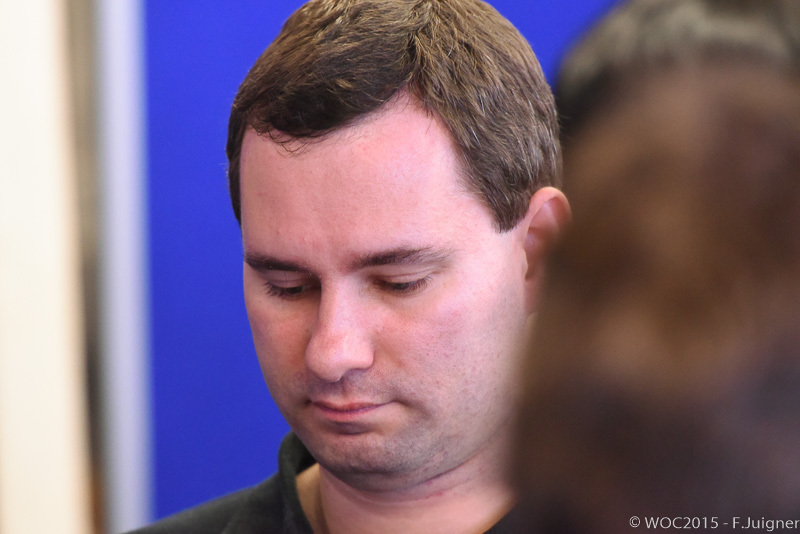 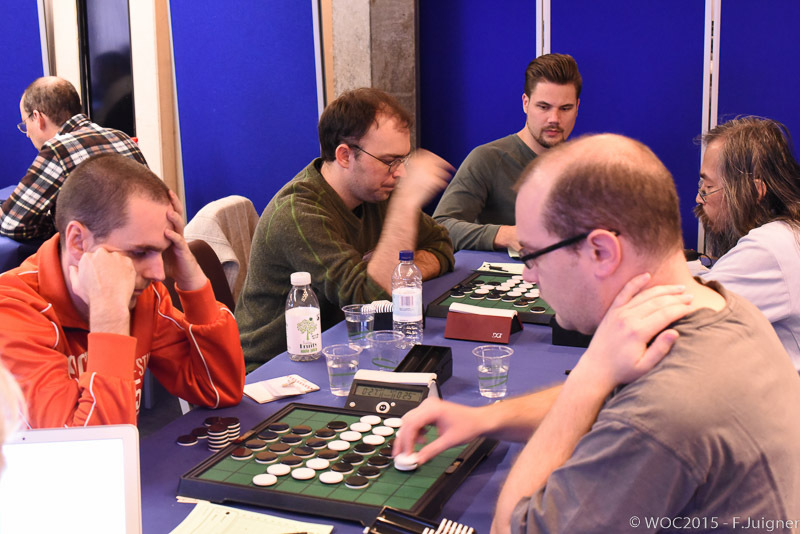 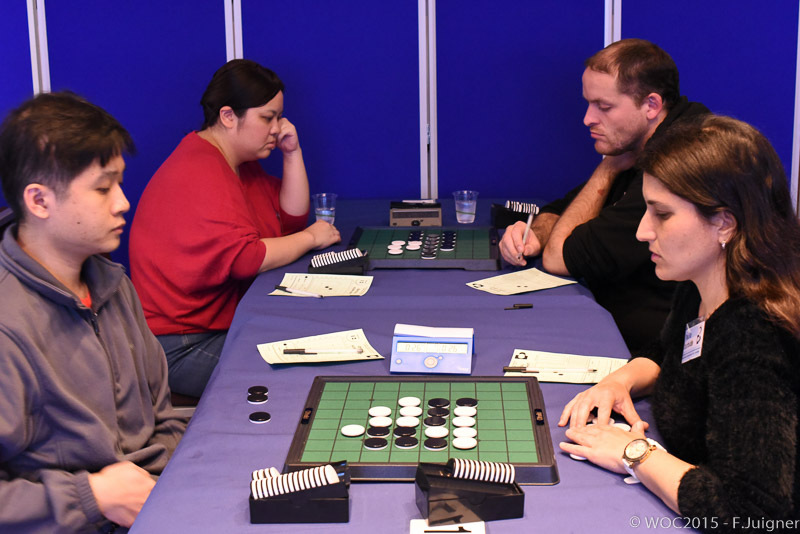 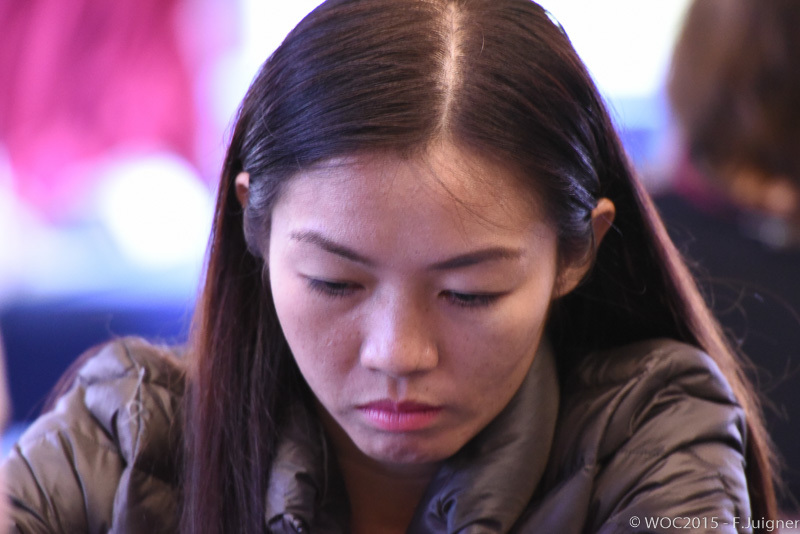 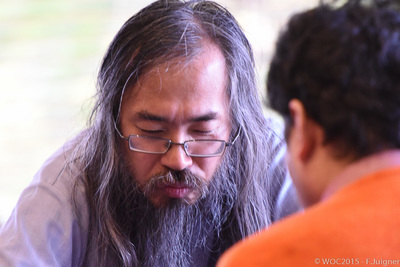 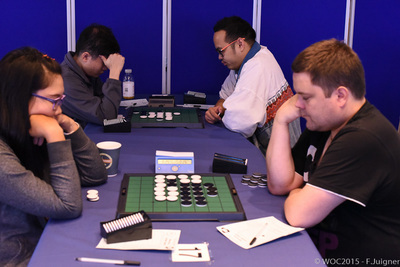 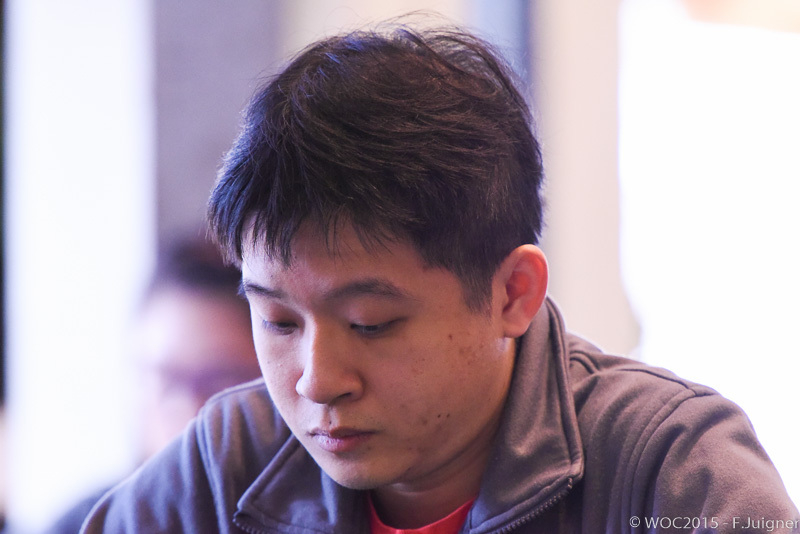 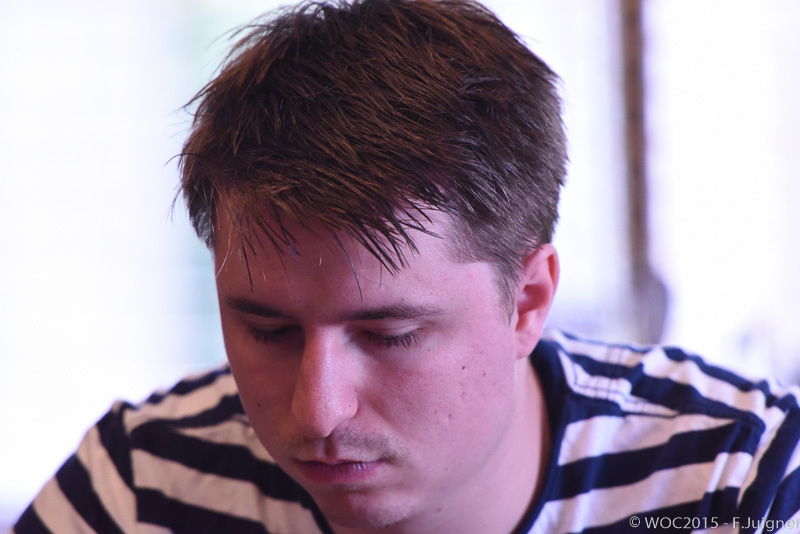 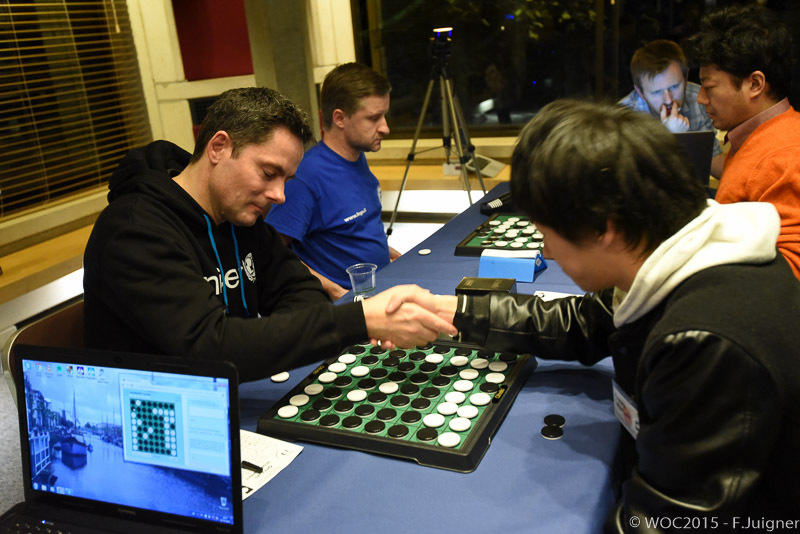 WOC round 12: Yusuke Takanashi and Makoto Suekuni lead with 10 points, Nicky van den Biggelaar keeps up with the two Japanese and Ben Seeley at 8.5 points is only half a point behind Nicky. Will these four play the semifinals? 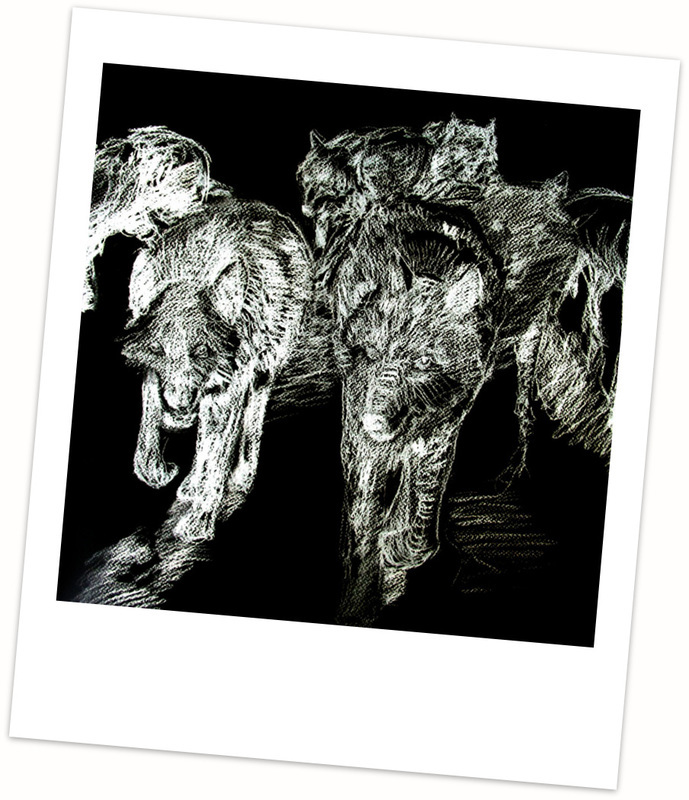 There is a hungry pack of Othello wolves waiting for a victim. Nicky and Ben are warned. Loose a point, loose your place in the finals. 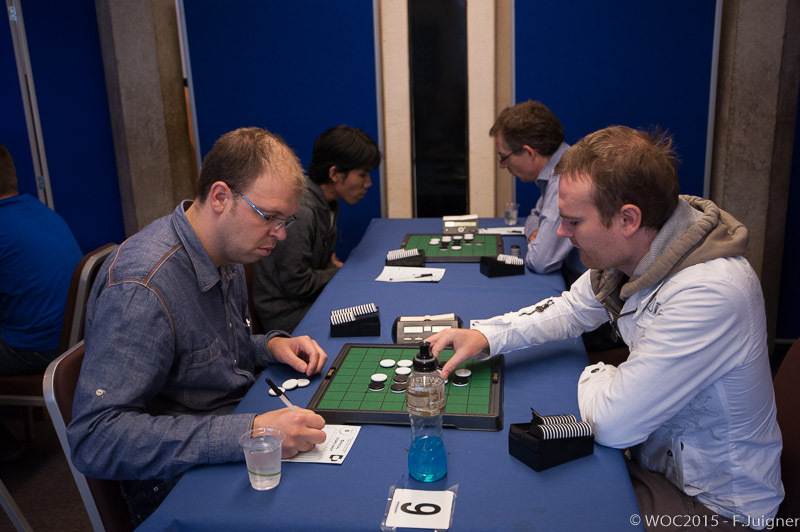 A lot of players still had a chance to make it to the final, depending on what Nicky and Ben would do. 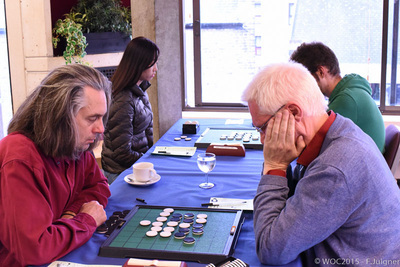 The tension at the top tables was enormous. I watched the game at table 1 Marconi-Suekuni. It was a super exciting game. Though he lost, Francesco was very happy to end the tourney with a game like that. 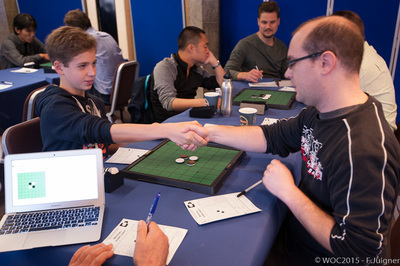 Especially after the unsuccessfull first day of tournament. With some of their best games, Yusuke Takanashi, Makoto Suekuni and Nicky van den Biggelaar qualified directly for the semifinals. 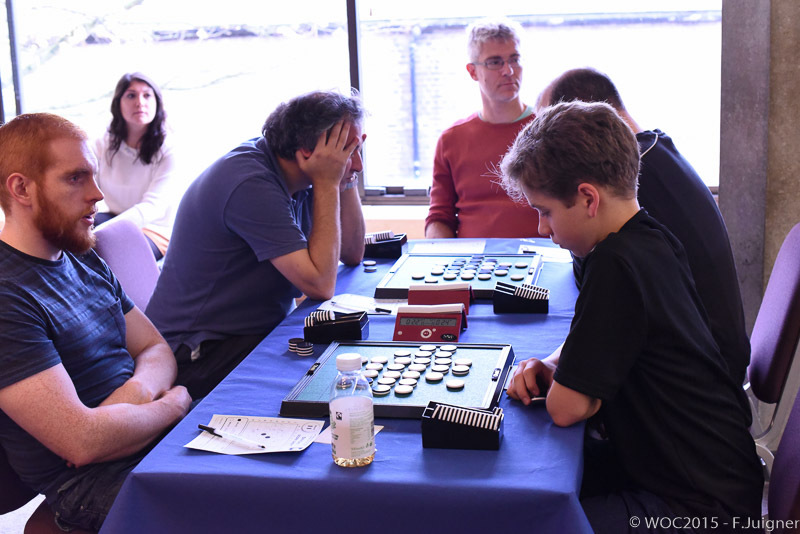 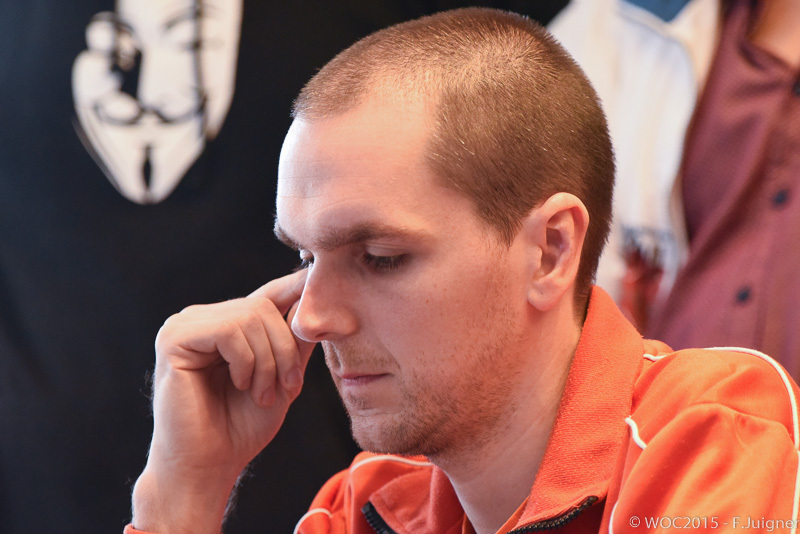 As Ben Seeley lost his game against Michele Borassi he missed out on the semis. The fourth spot in the semis was decided by a playoff between Takuji Kashiwabara and Michele Borassi. 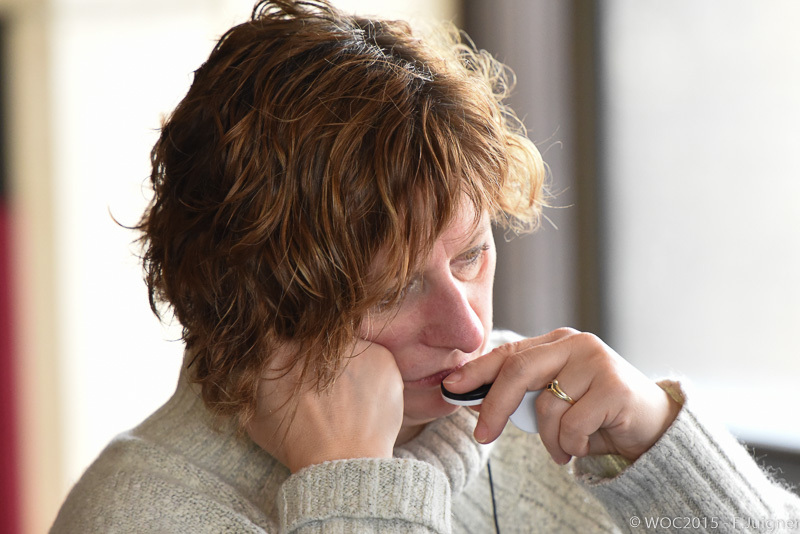 Michele won in a clever game that was all about parity for black. 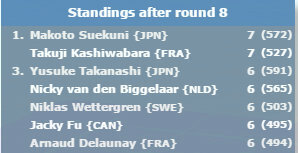 Team winner is............................. Japan! They collected 30 points, 6 points less than the high goal of 36 they set out to achieve but team Japan impressed us all again.